Music composers and directors, the talented, the valued, the respected and the beloved, pass away as would any other. The revered music director H.M. Jayawardena could not check out of Colombo South Teaching Hospital – Kalubowila, where the musician was under treatment for some time yesterday morning. He was 69 at the time of his death. H.M Jayawardena’s lake is still. Its surrounds may be messy. But the lake still looks at you, and the water in it runs deep. Herath Muidiyanselage Jayawardena, born in Monaragala Siyambalanduwa on March 17, 1950 (according to his birth certificate he was born on March 10, 1950; but according to Jayawardena, his father had told him that he was actually born on March 17, 1950 and “March 10” was due to a registration error), has been the silent force behind the popularity of best of singers in the local music. 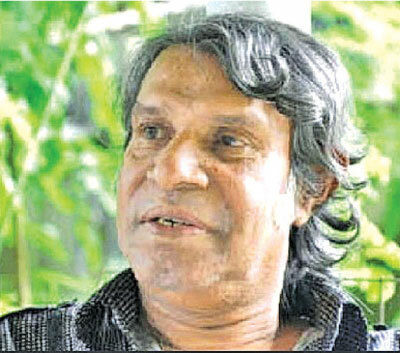 He married to late vocalist Malani Bulathsinhala in 1978. He composed Malani Bulathsinhalas classics Sanda Ahasa Wage, Obai Ramya Sanda Kirana, Raja Maduraka Ipadee Sitiyana(his first tune for Malini) and Obata Ma Adaraya Kala Bawa. The musician had a humble beginning as a freelance flutist at Sri Lanka Broadcasting Corporation. H.M always remembered the support he received from late maestro W.D. Amaradewa who had helped him in his musical career. H.M composed music with Rohana Weerasinghe in the film, Aaradhana. The artistes received “Sarasavi” award for their composition, “Sinawakin Puthuige Muwe” in that movie. He was a recipient of numerous awards, including the Presidential award in 1985 which he refused to accept. H.M had said about it that he refused to accept it because he thought that that the composition, which was by composer Premasiri Khemadasa, which was nominated for that award, was better than his own. As the old phrase says, 'Apple doesn't fall far from the tree.' Composer-singer Kasun Kalhara is H.M’s elder son, who has made a name for himself in the music field, is currently expected to act with more responsibility by those veterans in the music scene. They expressed their confidence that Kasun will carry his family’s musical legacy. H.M's body is lying at the Jayaratna Respect Reneral Home in Borella. H.M Jayawardena's last rites will be performed at the General Cemetery Knatte on Wednesday at 3 pm.